Karan is back again in the news. Today's Deccan Herald from Bangalore (29/02/08) has featured Karan and his mission for the underprivileged. 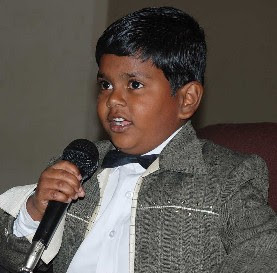 Karan Dravid, 8 year old boy is the Youngest Social Ambassador of Indian Development Foundation. At his age, children love to play. However, eight-year-old Karan is adept at handling and talking about serious issues like health, education and leprosy elimination. Eight-year-old Karan Dravid is more than what meets the eye. He speaks like a statesman, extempore, that is. Highly vocal about his concerns for the underprivileged, he is proud of being a teacher to the tribals. No guesses why he is the youngest social ambassador of Indian Leprosy Foundation, an NGO committed to health, education, rural development and leprosy elimination. A student of Kendriya Vidyalaya, MEG, Bangalore, Karan helps the underprivileged, the old, the tribals, HIV/AIDS victims and leprosy patients. Karan explains, "IDF is a programme for underprivileged people." Ask him who the 'underprivileged' is, and he is quick to answer, "those who live on footpath, those who have no money and those who have been thrown out of their houses." "I was successful in getting four computers from individuals and 17 computers from HP. I am now trying to get computers for IDF's projects from outside Karnataka," he beams. He stresses on the need of student social responsibility where in students should do social projects. He visits the tribals of BR Hills often. ``I read for them. I teach them how to speak in English," he adds. That he addressed the law graduates at a college in Mumbai is only a part of his oratorial skills. Of late, Karan has been visiting a couple of empowerment classes and spoken to students. IDF has also launched a programme called 'Karan programme 2K8' to mobilise computers for its empowerment schools in India. A student of Shiamak Davar's dance school, he would like to meet Hrithik Roshan some day. ``I just want freedom for everyone," he says. So what's freedom? "It's a happy place to live," he retorts. Click the link to see the report on Deccan Herald. Greetings and good wishes from IDF ! You would have either met Dr.A.R.K. Pillai or known about him through the workings of IDF. To get to know more about Dr.Pillai and a complete lifesketch on him, please click the link given below. The Mangalorean.com team, a news-portal from Chicago, USA has given a special feature on Dr.Pillai as the top story on 28th Feb.08, the man who touched the lives of many in the world, particularly poor leprosy patients. Let's take a journey into the life of Dr. Pillai. But for the continued support received from kind hearted people like, the dream of Dr.Pillai and IDF would have been a mere wish. 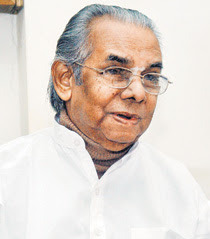 Dr. Pillai at 80 rededicates his life for the betterment of the society and seek your blessings in all humility. 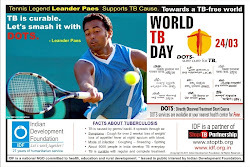 24th March 2008 is the World TB Day. 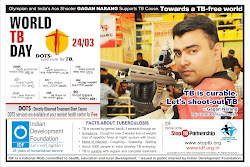 I Am Stopping TB is more than slogan. It is the start of a two-year campaign that belongs to people everywhere who are doing their part to Stop TB. World TB Day 2008 is about celebrating the lives and stories of people affected by TB: women, men and children who have taken TB treatment; nurses; doctors; researchers; community workers-anyone who has contributed towards the global fight against TB. One can download materials from http://www.stoptb.org/ that will help you make your own World TB materials like posters, web postings and video; and plan World TB Day activities. Mehul Kumar, a tenth standard student from Sanjay Public School, Jaipur is one of the top ten national winners for the Destination NASA Knowledge Test organized by 24X7guru.com. 24X7guru.com is an online guide for the students from class 3 to class 10 on subjects connected with mathematics and science. 24X7guru.com had recently organized a national level talent hunt programme wherein the top 10 winners from India will be sent to NASA. Dr. A.R.K. Pillai and Dr. Narayan B. Iyer from Indian Development Foundation reached Sanjay Public School in Lal Kothi Scheme, Jaipur this morning to congratulate Mehul Kumar for his wonderful achievement. IDF team had the good opportunity of interviewing Mehul on his mission NASA and wished him good luck in his ensuing exams and also the project `destination NASA’. The genius boy of 15 with a bent on scientific excellence, Mehul Kumar has the ambition to become a Space Scientist. No sooner I got the information about Destination NASA contest, I immediately registered my name for appearing in the online tests. There were three rounds and I found it interesting answering all the questions with ease, said Mehul with a smile. Though my parents are not from science background, they encouraged me to pursue my ambition, said Mehul. Mehul Kumar is the second son of Mr.Suryakant Sharma and Mrs. Gayatri Sharma who expressed their happiness on their son winn ing the recent Destination NASA talent contest. The proud parents are also happy about their eldest son, Yash Kumar who is keen on science and astronomy. Mehul’s role models are Albert Einstein and Stephen Hawkings, When asked whom he would like to meet at NASA, Mehul said in a polite tone Sunita Williams and Zimmerman who are very dear to him. Of course, meeting Dr.Abdul Kalam, the former President of India would be my greatest dream. Winner of several talent and knowledge contests, Mehul Kumar is also the winner of the title Balshri in Creative Science contest, which he will be receiving from the President of India shortly. Poetry, watching movies and playing chess are some of my hobbies. Yes, playing computer games also helps me to think on scientific ways, added Mehul in a jovial mood. When pressed for a message for his peers, Mehul said irrespective of the fields one chooses, one must do full justice to reach the pinnacle. There is nothing called impossible, if once can think high, reaching that destination becomes easier, he added. Mrs. Sudha Bhatia, Principal of the School was all praise for Mehul and said he has made all of us proud. The management of the school joins me in wishing Mehul Kumar best of luck in his future programmes, she added. Recollecting the incident of social work done for Indian Leprosy Foundation for a couple of times, Mehul said I vividly remember of having the Foundation team coming to our school in connection with leprosy awareness programme. I could join the schoolteam in mobilizing resource for the poor leprosy patients. I still have the memento and the certificate which I received from Indian Leprosy Foundation, asserted Mehul. Every student should take part in the social responsibility programmes carried out by NGOs for the benefit of the underprivileged people in the society, he stressed. Dr.A.R.K. Pillai and Dr. Narayan B. Iyer invited Mehul Kumar to become the `IDF Student Social Ambassador’ . I am honoured and feel elated to get this status today, said Mehul with a smile. For a complete list of the winners forNASA and other winners in 24X7guru.com's Knowledge Test please click the link http://www.24x7guru.com/result3.html. IDF congratulates all the winners and wishes best of luck for their studies and mission in life. Tilak Bal Gurukul an empowerment school of Indian Development Foundation (IDF) and Sarthak Manav Kushthashram (SMK) got a facelift on Saturday the 23rd Feb. 2008. TBG a project of IDF and SMK was started two years ago for the underprivileged children of Langadiyawas which is located in Ramgarh Tehsil in Jaipur (approx 25 kms from Jaipur). Most of the students of the school are first time school-goers in their families. Mr. Brij Kishore Sharma, MLA, Jaipur Rural inaugurated Tilak Bal Gurukul in the `Community Hall' of Langadiyawas village. It was two years ago that TBG was started by SMK & IDF in the rural area of Jaipur in an old structure. Looking at the progress of the school function, Mr. Brij Kishore and the village authorities have decided to shift to TBG to the newly constructed `Community Hall'. Empowering children through education is the key to India's dev elopment, observed Mr.Brij Kishor Sharma and this exercise has a great relevance in Rajasthan, he added. He congratulated SMK and IDF for sustaining this programme and providing excellent education. Mr. Suresh Kaul, President, Sarthak Manav Kushthashram presenting a report of TBG, Langadiyawas village said the efforts of the teachers and the students have borne fruit and they are blessed with a new building today. The teachers of TBG schools are very committed to the student education and they have brought about a lot of transformation in this village, he added. Dr. A.R.K. Pillai, President of IDF paid compliments to SMK team in developing this noble project to a successful level. He also congratulated the dedicated teachers of TBGs for their excellent contribution in the moulding of students. Dr. Narayan B. Iyer, National Co-ordinator, IDF outlined further programmes for strengthening student empowerment in Rajasthan. He quoted the latest rank of India rising high in the area of social transformation surpassing even Singapore. Education is the key to progress, he added. Indian Development Foundation (formerly Indian Leprosy Foundation) in its diversified activities has taken up rural development and education as the prime objectives. There are 15 empowerment classes/ schools established by IDF in different parts of India where complete education is given free of cost. International dignitaries present at the function like Mrs. Thea Kosse Muckli and Mrs. Klara from Leben Ohne Lepra eV., Papenburg, Germany – Mr. Daniel Fillod from Club Nomades, France and Mrs. Christine Laloutte from CEHDYS congratulated the good work of Tilak Bal Gurukul and wished all the students good education. TBG students staged a couple of dance programmes to entertain the gathering. Panchayat authorities and a large number of villagers were present to witness the occasion. Mr. Ramji Lal Jangid, Panchayat President, Langadiyawas village thanked IDF and SMK for their education gift to the village. We are really happy to get this new building. It only shows that there is light at the end of the tunnel, said Rajesh Meena a students of standard IV. I wish to become an IAS officer and help the poor and the needy in the country. My school-mates have a good ground to play too, said Anju another student. A glimpse of happiness could be seen on the faces of the TBG students as they moved to the new school. Mr. Mohd. Gauhar, Chief Manager, Ramgarh Re-integration Centre proposed a vote of thanks. For more photographs, please click the link given below. 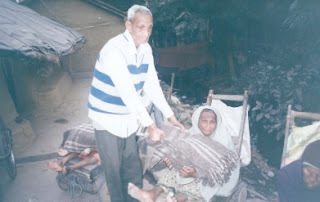 We wish to share the success story of `blanket mobilising movement' which helped a number of leprosy affected persons. No sooner the appeal reached the people, we started receiving blankets for the protection of poor leprosy affected persons to protect them from biting cold. 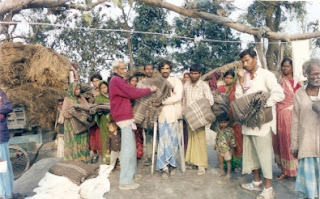 We write to thank all the `karmayogis' for their kind support in mobilising blankets for leprosy patients. The call for blankets given through Karmayog website was timely responded by a couple of friends. Our thanks to Karmayog too for their continue d support. 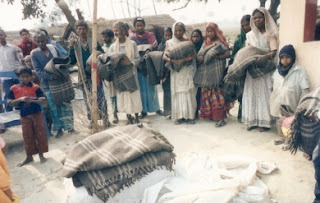 On behalf of all the leprosy affected persons and friends in the leprosy colonies we send our sincere thanks to all the donors-well-wishers and their family members for timely providing the inmates with blankets to protect from the biting cold. 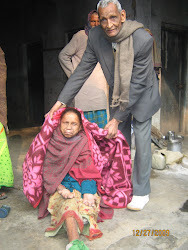 Mr. Thomas from Kusht Niwaran Society, Patna, Bihar was instrumental in co-ordinating the blanket distribution to the leprosy colonies in Bihar, while the blankets in Rajasthan were distributed through Sarthak Manav Kushthashram in Jaipur and Ajmer. We could also distribute blankets to leprosy persons in Ooty region. The blankets received in Mumbai were distributed locally. This is a real success story of benevolence. Mahatma Gandhi said, `find the purpose, the means will follow'. Once again our thanks to the `karmayogis' for all the timely support. We look forward to your kind patronage in the near future too. The Art of Giving - `The more you give, the more you will get'. Visually challenged people are also called `differently abled' people, said Dr. Narayan B. Iyer. Every individual has the capacity and ability to perform good in his life. We are fortunate enough to get eye-sight, but there are millions in this country who are blind. India has the largest number of blind population. Of the 37 million across the globe, 15 million are in India, but 75% of which are controllable, said Dr. Narayan B. Iyer, National Co-ordinator of Indian Development Foundation. Dr. Iyer was addressing a group of 200 students from Podar International School, Santacruz (W), Mumbai who visited the M.N. Banajee Industrial Home for the Blind at Jogeshwari West as part of their social responsibility programme. Dr. Sharad Nayampally and Mr. Sanjay Waghmare from IDF explained the various activities being organised at the Centre. Indian Development Foundation a leading national NGO committed to health, education and rural development, organised a social trip for the Podar International School students to The M.N. Banajee Industrial Home for the Blind at Jogeshwari on 20th Feb.
Mrs. Sarala Gavane led a group of 200 students from her school along with a couple of teachers to the Industrial Home for the Blind. Under the CAS (Creativity, Action and Service) programme students from IB Schools have to take part in social service activities, said Ms. Sarala Gavane, CAS Co-ordinator of Podar School. We are happy that our students are getting good exposure to the social programmes and getting to learn things with the help of IDF, said the teachers of Podar. Students from 5th, 6th and 7th standards arrived in the morning hours of Wednesday at the MNB Industrial Home for the Blind to see for themselves the industrial training that is being imparted to the visually challenged people. There are several who are regularly working in the Home. Some stay here while there are people who travel from different parts of Mumbai and work here. In these days, when it is difficult to get a job for the abled person, one can understand the conditions of the visually challenged person, said Mr.Suryavanshi, incharge in the Home. People in this Home are professional in making handicrafts, bedsheets, towels, hangers, candles, dusters and they also weave wire-meshed chairs, explained Mr. Suryavanshi. We also run a computer centre for the low-vision people and totally blind people, he added. Podar students went round the Home and were wonderstruck to see the beautiful products made there. Students were amazed to see the professionalism and creativity of the visually challenged people. I was happy to see the cute and colourful candles made by the people here, said a student. We congratulate all the `differently abled' persons and wish them good luck, said the visiting students. We learnt that the programme used by the visually challenged people to learn computer is JAWS. What an amazing thing to see them using computer and sending emails, the Podar students expressed. Dr. Sharad Nayampally made the famous quote of Helen Keller saying `the most pathetic person in the world is someone who has sight, but no vision'. Click on the below given link and catch the golden moments of Mumbai. It is a dream come true for the students of Shyama Vidya Mandir to get an exposure to Mumbai on Sunday, said Dr.Pillai. Exposures and seeing things can definetely change the perspective of the students. It is the need of the hour that students in a rural-setup see the developing world and thereby develop themselves, expressed Dr. Pillai. A group of 60 students from SVM visited Mumbai for the first time on Sunday the 17th February 2008 along with a couple of villagers from Tammnathwadi. Shyama Vidya Mandir is an empowerment school of Indian Development Foundation operated in Tammnathwadi in Karjat Taluk of Raigad District of Maharashtra. IDF has been running this empowerment school for nearly 5 years now. Indian Development Foundation in its diversified activities has taken up rural development as one of the objectives. Like SVM, IDF has established 15 emp owerment schools in different parts of India. The students led by Mrs. Vimalatai, President of Tammnathwadi Panchyat, Ms. Baby Sawant, school teacher and a couple of volunteers left Tammnathwadi at around 7 and reached Mumbai by 9 on Sunday morning. It was all a thrill filled with life and enthusiasm for the students seeing different places in Mumbai. The students who are confined to a rura l set-up, visiting Mumbai was like visiting a foreign country, said Vimalatai. I am very happy that my students are given a wonderful experience of the Sky Theatre and gazing stars in the Nehru Planetarium was a real effect of the stars in the sky, said Ms. Baby Sawant teacher of SVM. Bridging rural-urban divide is also the agenda of India 2020 programme of Dr. Kalam, said Dr. Narayan B. Iyer. We felt happy to see happiness on the faces of the innocent children of this rural village, he added. Mumbai Darshan included visit to the newly inaugurated Metro subway in Marine Lines, BMC Building, CST Station, Gateway of India, Nariman Point, Chowpatty, Malabar Hill, Hanging Garden, Nehru Planetari um, Siddhivinayak Temple and Juhu Beach. "Thanking IDF for the wonderful experience provided, Laxman Bhau Pawar, a student of Shyama Vidya Mandir said, Mumbai Darshan was really a feast for our eyes. We will certainly share this golden moments with our friends in our village, he added. The SVM team was received by Dr. A.R.K. Pillai, founder President of IDF and his team at Sion Circle. Further a team of students from Podar International School, Santacruz led by Mrs. Sarala Gavane joined the SVM students at the newly inaugurated Metro Subway in Marine Lines. Podar students, as part of their social responsibility activities, volunteered in the excursion helping the visiting students. I am thankful to IDF for giving me and my CAS students an opportunity to participate in such a wonderful social excursion, said Mrs. Sarala Gavane, the CAS co-ordinator of Podar International School. My students did their best in volunteering in the social excursion event and such activities should be a regular feature in all the schools, she added. Seeing the students splashing water in Juhu beach, participating in the running race and mingling with the Mumbai students really added more colour to the event, expressed Dr. Sharad Nayampally, IDF ambassador. All the students kept their eyes and ears open throughout the event and got immersed into the magnificent moments in life, he asserted. The entire travel and sight-seeing programme organised by IDF was an eye-opening for the village students visiting Mumbai for the first time. A couple of parents also joined to taste the life of Mumbai. Dr. Narayan B. Iyer and Dr. Sharad Nayampally from IDF were the guides for the visiting students explaining various points of interest. They had to finally quote the famous line to the visiting students by saying, "Yeh hai Mumbai meri jaan". Rajkiya Maharaja Balika Sr. Sec. 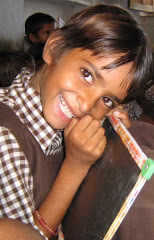 School, Chhoti Chaupad, Jaipur supports Indian Development Foundation. We are fortunate that our students from Government School too participate in the national development programme, expressed Mrs. Archana Sharma, Principal of the School while presenting the resources mobilised by the students for the cause of leprosy rehabilitation in Rajasthan to Dr. Narayan B.Iyer. Dr. Narayan expressed his thanks to the Principal and also the two teachers Mrs. Rekha Tiwari and Mrs. Preeti Bala Gupta for their stupendous support to IDF. Rajkiya schools has been a regular supporter of leprosy rehabilitation programme and the signal role played by the students need special appreciation, said Dr. Narayan. Aim high and reach greater heights in life, said Dr.Narayan to the students. Women empowerment is the buzz word these days and the increasing number of girl-education in Rajasthan is indeed appreciative, he added. The Students later received IDF's BEST WISHES poster for the ensuing examination. Dr. Narayan B. Iyer met Mr. Daniel Fillod and Mrs. Christine Lolouette from Club Nomades, France during his recent visit to Jaipur. The team discussed on the various issues concerning rehabilitation of leprosy patients and development of rural areas in Rajasthan. Mr. Daniel Fillod through his Club Nomades friends in France has been supporting the Ramgarh Re-integration Centre in Jaipur. RRC is one of the biggest rehabilitation centres in India catering to the reintegration of leprosy inmates. Mrs. Christine Lalouet te from Vence, France has been responsible in sponsoring the land and building a school in Nonpura village in Jaipur called `Tilak Bal Gurukul' through the support of the members from CEDHYS Association. Tilak Bal Gurukul, Nonpura, Jaipur is a `village empowerment school' of IDF run in Jaipur in collaboration with Sarthak Manav Kushthashram. Dr. Narayan B. Iyer, National Co-ordinator, IDF and Mr. Suresh Kaul, President, SMK thanked the Club Nomades team for the continued support extended towards the humanitarian programmes in India. IDF is thankful to all the schools for their solid support to humanitarian programmes. Today's (11-02-08) Mid-day newspaper in Mumbai has carried an article on Dr.A.R.K.Pillai, founder President of IDF. Dr. Pillai recollects and cherishes his golden moments with Baba Amte, the saint of social work. Please click the link given below to get the news for you. Rededicating our lives for the service of the nation. We value your continued patronage. With the passing away of Baba Amte, India lost the brightest star in social firmament. A Titan among social workers, Baba Amte distinguished himself as a humanitarian par excellence for his decades of exemplary service. He took discarded leprosy patients to his fold when social stigma was at its peak. He founded Anandwan for giving shelter and total care for leprosy patients and lived among them all his life. 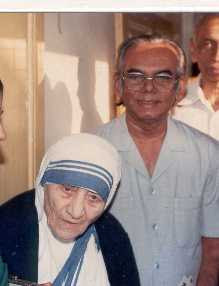 He demonstrated to the world that love and dedicated work can bring immense happiness to leprosy patients discarded by an unrepentent society. Baba Amte brought to focus the plight of leprosy patients and opened the eyes of the society for understanding and care of leprosy patients. With the drastic reducting of leprosy cases from 4 million to less than a lakh, India achieved leprosy elimination status. Baba Amte's spectacular contribution to the cause of leprosy earned him many national and international awards, the major ones include Magsaysay Award, Padma Bhushan and Damien Dutton Award. Long physical ailments didn't deter him from his avowed goals, he inspired innumerable people to help the cause of leprosy. The void left by him is difficult to fill and leprosy sufferers feel orphaned by his demise. 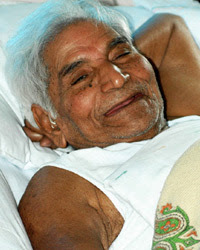 Baba Amte did India proud by his selfless and distinguished humanitarian work. He will certainly live in the minds of millions of people the world over. IDF News straight from Chicago. `Rotary Club honouring Karan' and `A day at Dominos' have been published in the Mangalorean.com portal hosted from Chicago, USA. IDF thank Mr. Roshan Desouza, Founder & Creator and Mrs. Queenie Mendonca, Managing Editor of the Mangalorean.com for their kind and continued support. The martyrdom of Mahatma Gandhi is observed globally as World Leprosy Day. Starting from 30th Jan. to 5th Feb. the week is observed as Anti-leprosy week with a view to create awareness on the disease. 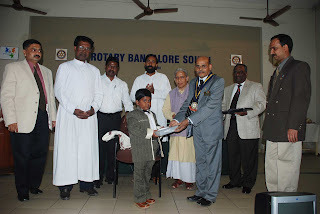 The Rotary Club of Bangalore South thought it proper to honour Karan Dravid, the youngest Ambassador of Indian Development Foundation (formerly Indian Leprosy Foundation) on this very day of our dear Bapuji by launching IDF's Karan programme 2k8, said Rotarian Rampur S. Vishwanath. Rotarians appreciated the initiatives of Karan Dravid in reaching-out the poor and needy children by mobilizing 17 computers for the benefit of tribal, orphan and disabled children in Karnataka. Eight year old Karan Dravid, student of standard 3, from Kendriya Vidyalaya MEG Centre, said he was keen to support the poor students studying in the empowerment schools of IDF, located at remote regions of the country. Karan's aim is to mobilize nearly 1000 computers and distribute it to poor schools throughout India through IDF. Indian Development Foundation a leading national NGO committed to health, education and rural development initiated Karan Programme 2k8 to mobilize computers for the rural and tribal children studying in its empowerment schools.
. Rtn. Rampur S. Viswanath who was the Chief Guest for the Function and the executives of the Rotary Club of Bangalore South appreciated the work of Indian Development Foundation as they honourred Karan for his commitment to serve the underprivileged children. The computers were distributed to 3 of the empowerment schools of the IDF, namely: Vivekananda Bal Gurukul in BR Hills, Maria Nikethan Bal Gurukul in Bangalore and St. Joseph's School in Bangalore. Mr. Somasundaram, Treasurer of Karuna Trust, Fr. Gregory, Secretary of Maria Nikethan School and Fr. George Kannanthanum, Director, Summanahalli Leprosy Centre received the computer on behalf of the empowerment Schools. Mr. Suresh, Chairman of the Sankya Programme of the Rotary Club and Mrs. Yogeshwari of the Hewlett Packard company were instrumental in arranging the computers for the IDF's empowerment schools. While thanking the initiatives of young Karan in providing e-learning facility for the underprivileged, Dr. S. Franklin, the Area Manager of IDF for Karnataka, conveyed sincere gratitude to the Rotary Club of Bangalore South and HP Company for lending timely support and reviving the enthusiasm of the teachers in the empowerment schools. As part of student social responsibility act, a group of students from St. Xavier's College thought of giving the children of St. Catherine's School an exposure to the world of pizzas. Bernice Priscilla Paradesi, a management student alongwith her classmates took the children from St.Catherine's School, Veera Desai, Andheri (W) to the Dominos Pizza at Thakur Village on 30th Jan. St. Catherine's Home is an associate project of Indian Development Foundation (IDF) a leading national NGO based at Goregaon west which runs an empowerment class for the students. Bernice who is also the Student Social Ambassador of IDF does a lot of social responsibility activities along with her collagemates. What more can be satisfying to us than giving the children an exposure of the world of pizzas, said Bernice. A group of 50 students from St. Catherine's School were taken to the Dominos Pizza on Wednesday. The visiting children were given a warm welcome and were straight away taken to the workstation of making pizzas. They were shown the method of making delicious pizzas which the children enjoyed. Pizzas are generally liked by children and i love eating them, said one of the student from St.Catherine's School. We thank St. Xavier's College students and the Dominos for bringing us over here. We really relished the tasty pizzas which would have been only a dream for us, said the other student. We immediately welcomed the idea of the BMS students of St.Xaviers Colleges and accepted the social responsibility programme, said Mr. Ravindra Shelar the store manager of Dominos. Fr. Frazer, Principal of St. Xavier's and Ms. Neelam Shetty, Co-ordinator of St.Xavier's BMS wing congratulated the students for such innovative social programmes. Joining hands with Indian Development Foundation and various other NGOs and helping them in reaching out the havenots is indeed a creditable gesture, Dr. Narayan Iyer, Co-ordinator of IDF said. The team from St. Xaviers College included Bernice Paradesi, Vinita D'souza, Shalanta Mascarenhas, Disha Rayen, Ansa Abraham and Ninatte Quadrose. The event was co-sponsored by Hangout Cakes and organised by Mr.Sanjay Waghmare and Mr. Jayaraja Acharya from IDF.